A rock band from Brooklyn began a couple years ago when David Billingsley wanted a more alternative/grungy sound. He split off from the nerd-funk quintet Space Clamps, to form Mary’s Roommate. After an initial line-up re-arrangement, he recruited me to play drums, Richard Brown (drummer from Space Clamps) to play bass, and Lawrence De Geest (guitarist from Space Clamps) to play lead guitar. The album Useless! was recorded in a weekend at Swan7 in Bushwick, Brooklyn in January of 2014. It features three classic Billingsley numbers in Humans are Useless, the Least Common Letter, and Jesus (the Carpenter), a whirlwind Straight Through Me conceived in the rehearsals leading up to the recording, and a De Geest and Billingsley duo in Some Day. You can listen to the 5 song album here. The album release concert is Saturday, March 15 at 8p at Lit Lounge in New York City. 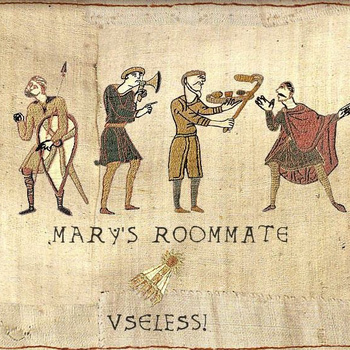 1 comment to Mary’s Roommate Album: Useless! Is this album about me?